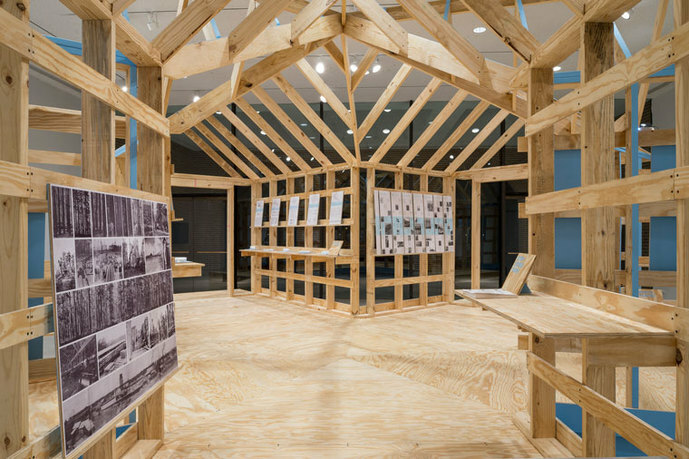 Atelier Bow-Wow in collaboration with Jesús Vassallo and students of the Rice School of Architecture, view of SHOTGUN, Rice University Art Gallery, 2015, Houston. Photo: Nash Baker. 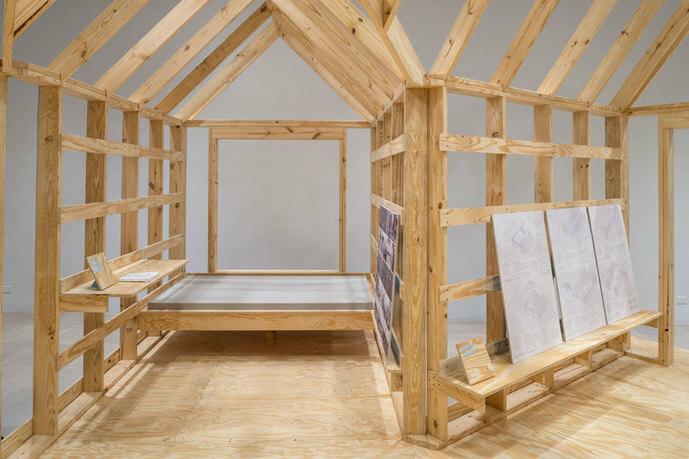 At the center of Rice Gallery sits SHOTGUN, a house-like structure inspired by Houston’s historic row houses. 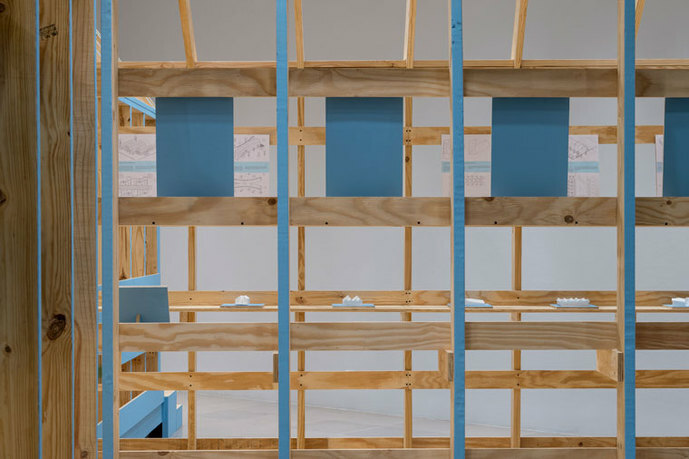 The title for the installation comes from the row house’s common nickname “shotgun,” a term coined to describe its corridor-like layout that allows a clear path or “shot” from front to back door. 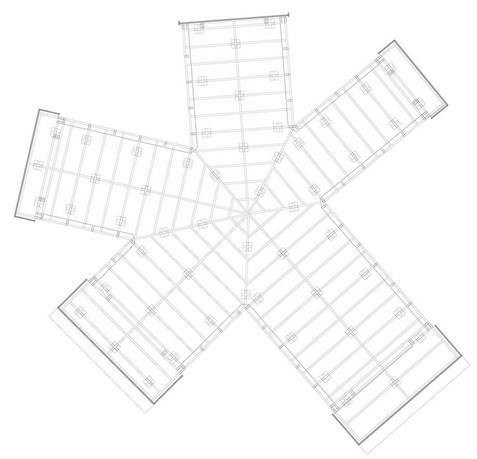 This deceptively simple architectural form, comprised of understated geometry (an elongated box with a pitched roof) and basic construction, was often passed down without formal plans or drawings and made from scrap wood or inexpensive lumber. 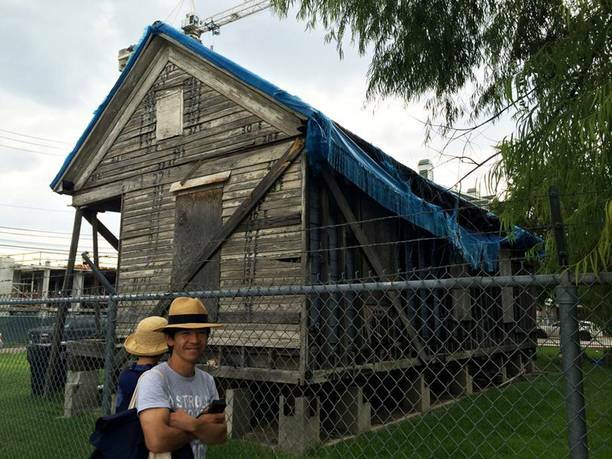 Principals Yoshiharu Tsukamoto and Momoyo Kaijima of Atelier Bow-Wow collaborated with Rice School of Architecture assistant professor Jesús Vassallo and students of the Rice School of Architecture to dig far beneath the surface of this assumed simplicity and to celebrate the row house’s ingenuity. 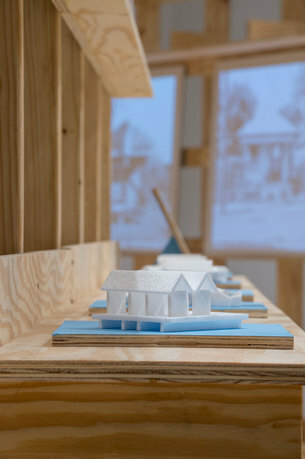 Over the fall semester of 2014, Atelier Bow-Wow and Jesús Vassallo taught the course “Learning from Houston” to intensively study the row house’s history and contemporary condition and to simultaneously use this research to design and build this new site-specific installation for Rice Gallery. Yoshiharu Tsukamoto was born in Kanagawa, Japan, in 1965. He studied architecture at Tokyo Institute of Technology, receiving his undergraduate degree in 1987. 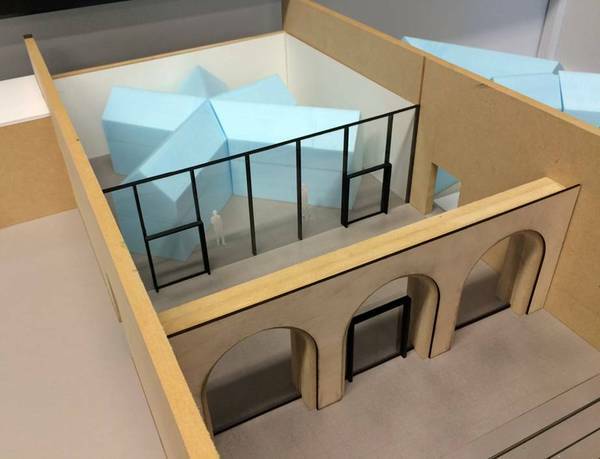 Tsukamoto travelled to Paris to be a guest student at L'Ecole d'Architecture de Belleville (U.P. 8) from 1987 to 1988. In 1994, he completed a doctoral program in engineering at Tokyo Institute of Technology. 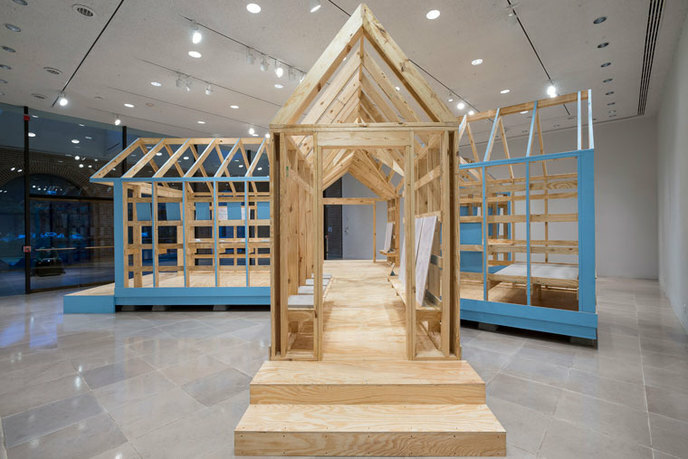 In 2000, Tsukamoto became associate professor at the Tokyo Institute of Technology, and in both 2003 and 2007, he was a Kenzo Tange Visiting Associate Professor in the Department of Architecture at Harvard University’s GSD. Also, in 2007 and again in 2008, he was a visiting associate professor at the University of California, Los Angeles (UCLA). From 2011 to 2012, he was a visiting professor at the Architecture School of the Royal Danish Academy of Fine Arts. In 2011, he was also a visiting professor at Barcelona Institute of Architecture. Momoyo Kaijima was born in Tokyo, Japan, in 1969. She received her undergraduate degree from Japan Women's University in 1991. Both her graduate and postgraduate degrees were from Tokyo Institute of Technology in 1994 and 1999, respectively. She was also a guest student at Eidgenössische Technische Hochschule Zürich (ETH) from 1996 to 1997. In 2000, Kaijima became assistant professor, and in 2009, associate professor, at the Art and Design School of the University of Tsukuba. Like Tsukamoto, in 2003 she was a visiting faculty member (as a design critic) in the Department of Architecture at Harvard University’s GSD. Between 2005 and 2007, she was also a guest professor at the ETH Zürich. In 2010, she was the Architect-in-Residence at the University of Auckland. From 2011 to 2012, she was a visiting professor at the Architecture School of the Royal Danish Academy of Fine Arts. 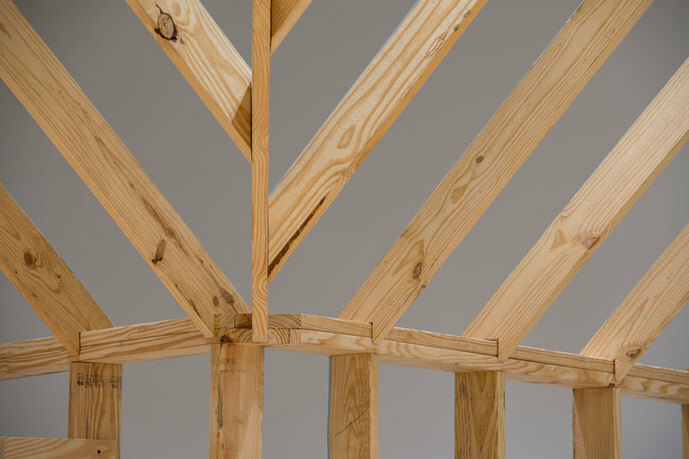 Kimberly Davenport defined Rice Gallery as a space for site-specific installation art and since 1996, artists, architects, and designers have created more than sixty installations there. 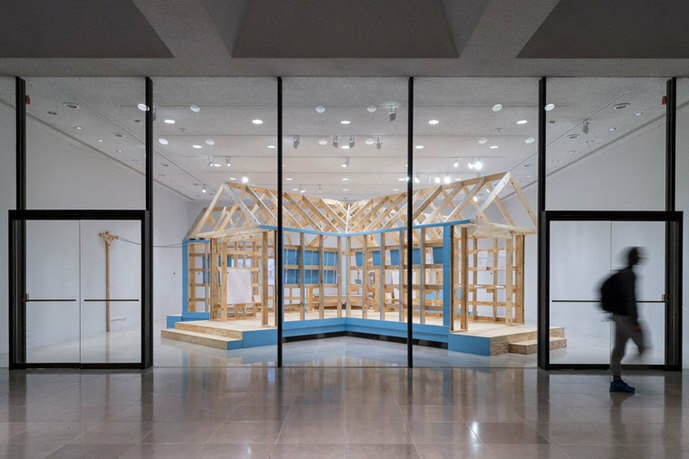 In 2013, Davenport received a Citation of Honor from the American Association of Architects Houston Chapter, and the Apple Valley Foundation's 2013 Curatorial Excellence Award. She is a National Peer of the General Service Administration's Design Excellence Program. 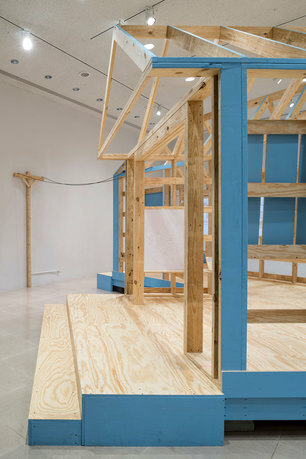 In 2012, Kimberly guest curated Contemporary Asian Art: Texas Connections, the inaugural exhibition for Asia Society Texas Center's new building by Yoshio Taniguchi. She holds degrees from Maryland Institute College of Art and Yale University. Jesús Vassallo is an architect and writer from Madrid, Spain. He studied architecture at Harvard University, graduating with distinction in 2006 and in the Escuela Técnica Superior de Arquitectura de Madrid (ETSAM), obtaining his professional degree in 2004. He has taught at IE University (associate professor, 2011–12), ETSAM (teaching fellow, 2007–10), Harvard University (teaching assistant, 2005–06) and the Boston Architectural College (visiting lecturer, 2005­–06). He is currently assistant professor at Rice University and his current research focuses on the mutual influence between documentary photography and architectural realism. Student participants: Bader Albader, Jacob Andrew, Amanda Chang, Ningxin Cheng, June Deng, Edison Ding, Yutian He, George Hewitt, Joshuah Howard, Sara Jacinto, Kerry Joyce, Yi-chiao Lee, Priscilla Leung, Joey Liang, Eleanor Ma, Marcel Merwi, Jaime Pages Sanchez, David Richmond, Pablo Ruiz Otaolaurruchi, Chris Yuan. 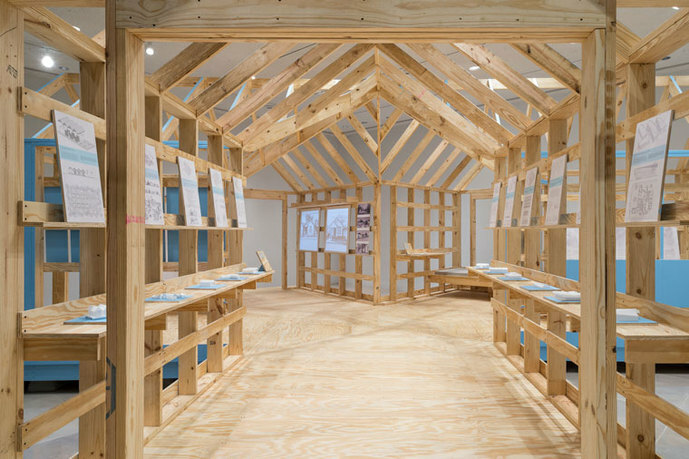 Since 1994, the mission of Rice University Art Gallery has been to stimulate the creation and understanding of contemporary art for the benefit of Rice University and the larger community. Goals in support of this mission: complement and support the educational mission of Rice University through exhibitions, publications, and educational programming in accordance with the highest professional standards; commission new work by artists of national and international reputation living outside of Texas, to give Houston audiences a unique art resource not otherwise represented in the city; present exhibitions that reflect the diversity and vitality of the best of contemporary visual culture, with a focus on site-specific installations; and enhance and promote the stature and public profile of the university nationally and internationally.